Since the beginning of space missions, the Earth’s bulls-eye caught the interest of astronauts in the otherwise featureless Sahara Desert. Over the years, it has become a landmark for astronauts. At first, the circular pattern was thought to have been a meteorite impact, but now the 31 mile wide bulls-eye, called the Richat Structure, is believed to be uplifted rock, a circular anticline, laid bare by erosion. 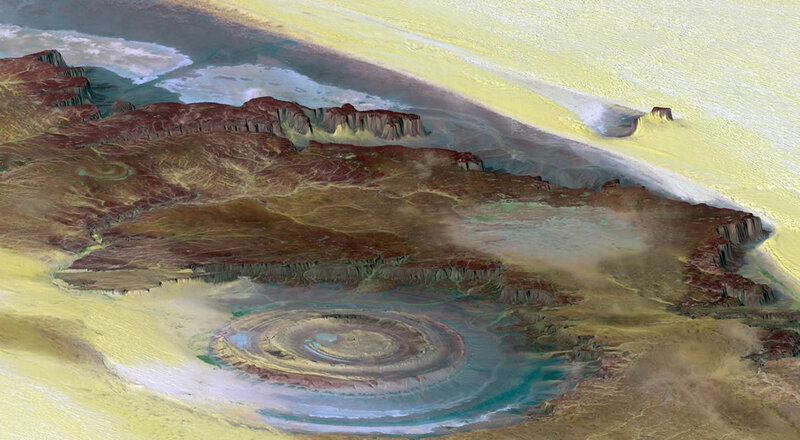 Some people call this bulls-eye in the Sahara the “Eye of Africa.